Saudi Arabia is not as rich as you thought. The oil kingdom is facing a big hole in its budget, caused by the slump in oil prices and a sharp rise in military spending. That's forcing the government to raid its reserves, and it may even borrow from foreign investors, analysts say. Saudi Arabia has already burned through almost $62 billion of its foreign currency reserves this year, and borrowed $4 billion from local banks in July -- its first bond issue since 2007. Its budget deficit is expected to reach 20% of GDP in 2015. That's extraordinarily high for a country used to running surpluses. Capital Economics estimates that government revenues will fall by $82 billion in 2015, equivalent to 8% of GDP. The IMF is forecasting budget deficits through 2020. Oil's slump from $107 a barrel last June to $44 right now is largely responsible for the squeeze. Half of the country's economic output and 80% of government revenue is generated by the oil industry. Yet Saudi Arabia has only itself to blame. Its aggressive fight to defend OPEC's share of the global oil market has led to a massive supply glut. Riyadh is refusing to cut output, hoping to drive other producers, such as U.S. shale companies, out of business. At the same time, it is ratcheting up spending. It has intervened in a war in neighboring Yemen, and has been involved in airstrikes against ISIS in Syria. Its military budget grew by 17% last year to roughly 10% of GDP. King Salman also lavished generous bonuses on public sector workers after his accession to the throne in January. The gesture was popular, but stretched the kingdom's finances even further. "We will see increased borrowing in the coming months," Fahad al-Mubarak, the governor of the Saudi Arabian Monetary Agency, told local media last month. The country's central bank would not comment on how many bonds it might issue. 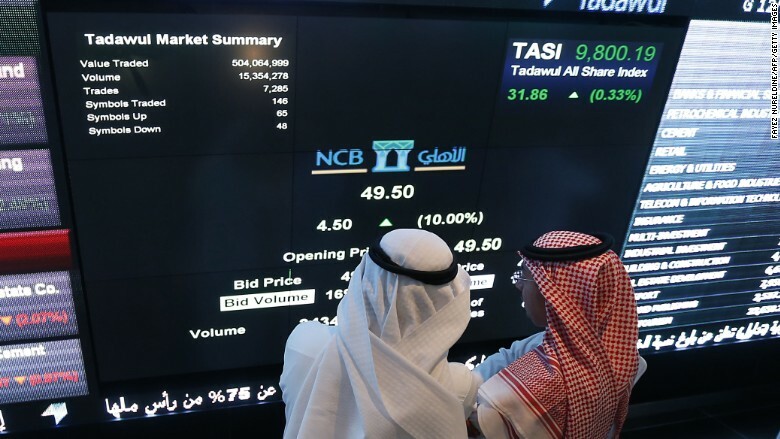 Analysts suggest the Saudis could issue around $5 billion worth of bonds a month through the end of this year, some of those to foreign investors. Still, it could quickly revert to drawing on reserves, rather than borrowing, if global interest rates rise. Its foreign currency reserves, while depleted, still amounted to $660 billion at the end of June.